HYGEIA Group offered free-of-charge medical and diagnostic tests to the residents of the Municipality of Kalampaka and the surrounding areas at November 13 & 14, 2015. This was the 5th action of the "Traveling for Health" program, which forms part of HYGEIA Group's Corporate Social Responsibility initiatives. Specifically, a team of 100 HYGEIA Group volunteers travelled to Kalampaka and performed 12,000 free-of-charge medical and diagnostic tests on approximately 2,000 residents. The team was made up of medical, nursing, technical and administrative staff. 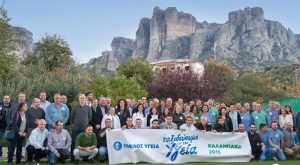 The exams were performed at the Divani Meteora Hotel Conference Center by a team of 40 physicians with 16 different specialties. The medical team included vascular surgeons, anesthesiologists, radiologists, gynecologists, dermatologists, cardiologists, orthopedic specialists, urologists, ophthalmologists, neurologists, internal medicine specialists, pediatricians, plastic surgeons, pulmonologists, general surgeons and ENT specialists. The facilities had been set up accordingly with equipment that had been transferred by HYGEIA Group vehicles. The diagnostic tests included 1,500 blood tests (CBC and biochemical), 1,380 body ultrasounds, 400 Pap tests, 400 gynecological ultrasounds, 1,600 cardiograms, 550 heart Doppler ultrasounds and 400 spirometry tests, while 100 minor surgeries were also performed. The physicians also treated 10 medical emergencies and one of the patients was transferred to a local public hospital by HYGEIA ambulance, after being deemed necessary by the HYGEIA Group medical team. HYGEIA Group also donated a defibrillator, blood pressure monitors, medical supplies and medications to the Kalampaka Medical Center. Upon delivery of the equipment, the Mayor of Kalampaka and representatives from the local Medical Center kindly thanked HYGEIA Group’s management for their generous donation, highlighting that these actions should serve as an example for all. The action was funded by the Marfin Foundation, while Vivartia, a member of MIG, offered juice and milk cartons to all the residents who sought medical advice.